In 1826 the St. John’s Park area was among the most exclusive residential neighborhoods in Manhattan. The park, anchored by the exquisite 1807 Georgian-style St. John’s Chapel, was ringed with fine brick Federal homes. Irish-born Tom Riley realized the potential for a high-class hotel in the neighborhood. Purchasing the property at the corner of West Broadway and Franklin Street nearby, he opened the 5th Ward Hotel in 1826. Outside a 174-foot flagpole, visible for blocks, became an instant landmark. 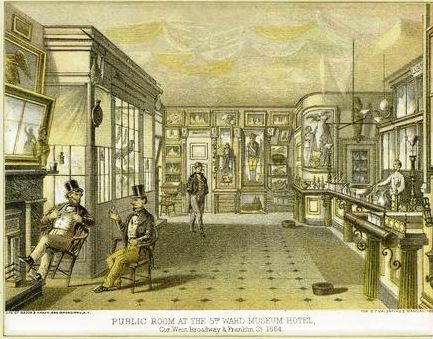 Riley sought to attract an exclusive clientele for his new hotel “surrounded by residences of men of noted financial, commercial and moral standing.” A consummate marketer, the hotelier displayed curiosities and historical artifacts in the public room. Before long, the establishment was known as Riley’s Fifth Ward Museum Hotel. There was a two-headed calf “eloquently stuffed,” portraits of prominent contemporary statesmen and soldiers, a silver “Indian medal” issued during the presidency of James Madison, and relics of the Revolutionary War. Nothing was included in the collection that would offend the sensitivities of the high-class customers. “There was nothing there that a prim young girl might not see,’ noted The Times. The museum room was a favorite of school boys who would beg Riley to be allowed to roam on their way home from school. The good-hearted Riley demanded proof that they had been good students and, if the proof was forthcoming, he let the boys in. Riley’s greatest attraction was a broken statue of the Earl of Chatham, William Pitt. In 1766 the city had commissioned London sculptor Joseph Wilton to execute two statues – one of Pitt and the other of King George. The statue of the king was cast in gilded lead and weighed 4,000 pounds; the other was marble. On the night of July 9, 1776 when the Declaration of Independence was received and read in New York, citizens threw ropes around the statue of King George and pulled it down. It was subsequently melted into bullets. In revenge, the British soldiers smashed off the head and one arm of the Pitt statue and carted what remained to the “corporation yard,” where it was forgotten among the rubbish. 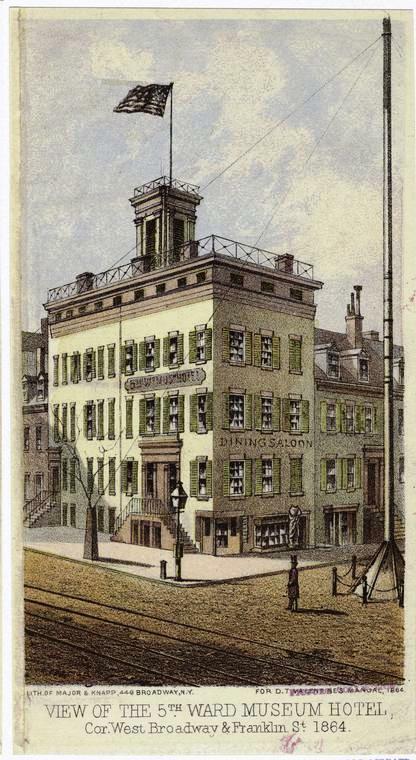 Tom Riley retired in 1851, leasing the business which continued as a high class, museum-hotel. That same year a longshoreman named John Daly was unloading a brig at the foot of Rector Street when he was shocked to come across a huge snake in the hold. “Yes, sir, I saw, with my own eyes, a snake, an’ no tame one, nuther, that was killed right here in the streets of New York, an’ measured twenty-two feet, fair measure,” he told Frank Leslie’s Popular Magazine. Thomas Riley died in January 1859 “possessed of considerable personal estate,” as recorded by the Superior Court. The operation of the hotel passed to M. M. Laird who continued its tradition of a high-class establishment. A tangled lawsuit concerning the ownership of the curiosities ended with the collection being auctioned off on February 12, 1864. The items carefully assembled by Tom Riley were sold off and the wonderful, quaint museum room was no more. The disfigured statue of Pitt was purchased by Samuel F. Mackie and presented to the New York Historical Society. Before long the fashionable St. John’s Park neighborhood would fill with rail yards and warehouses. By 1889 the 5th Ward Hotel was gone, replaced by a wholesale grocer.